MY KITCHEN IN SPAIN: MAKE ROOM FOR THE VEGETABLES! MAKE ROOM FOR THE VEGETABLES! Move over meat. Make some room on the grill for the vegetables. Hey, let’s give fish some space, too. Fruit! Stand up for your rights! That’s what I wrote in the Weber magazine, GRILL ON, coaching grillers everywhere to expand their grilling horizons, with a little Spanish flair. I didn’t provide recipes with the article (though there are lots of grilling recipes on Weber’s web site weber.com/grillon2018), just my suggestions for grilling veggies, fruits and seafood. Here are some of the ideas from my article, as I prepared them this week on my patio. Make room for the vegetables! Whether the main event or a side, vegetables really pop with color and flavor. 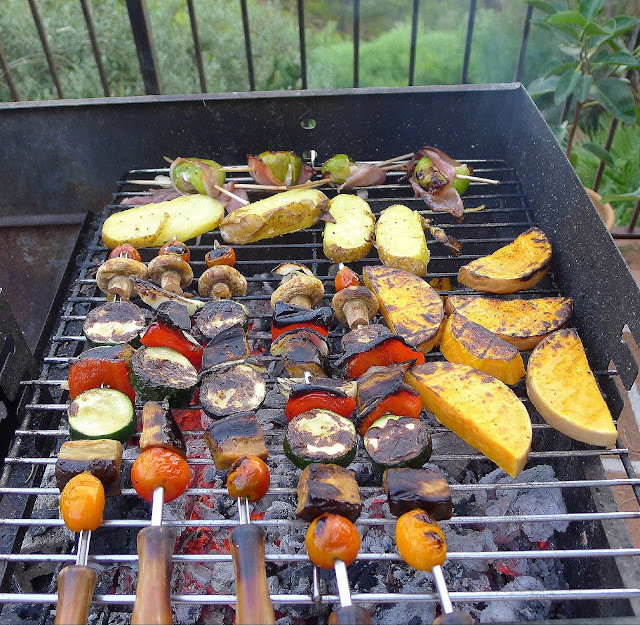 In the foreground are skewers with cherry tomatoes, eggplant, red pepper and mushrooms. On the right are thick slices of butternut squash,The sugar in the squash caramelizes, giving a golden crust. Behnd are potatoes that have been parboiled and thickly sliced. 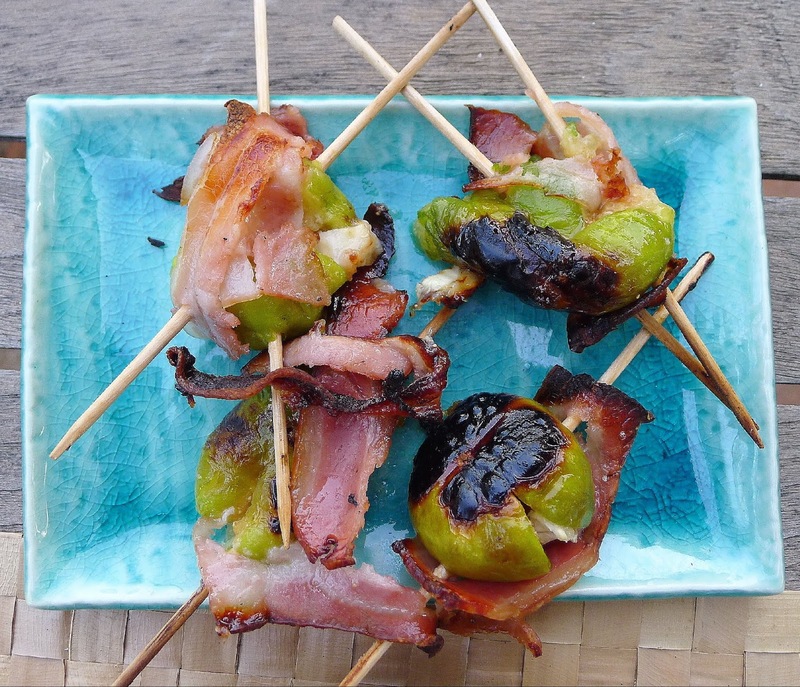 At the back are ripe figs stuffed with goat cheese and rolled in bacon. We use a big grill fueled with charcoal or wood. My son Ben is the experienced grill master. 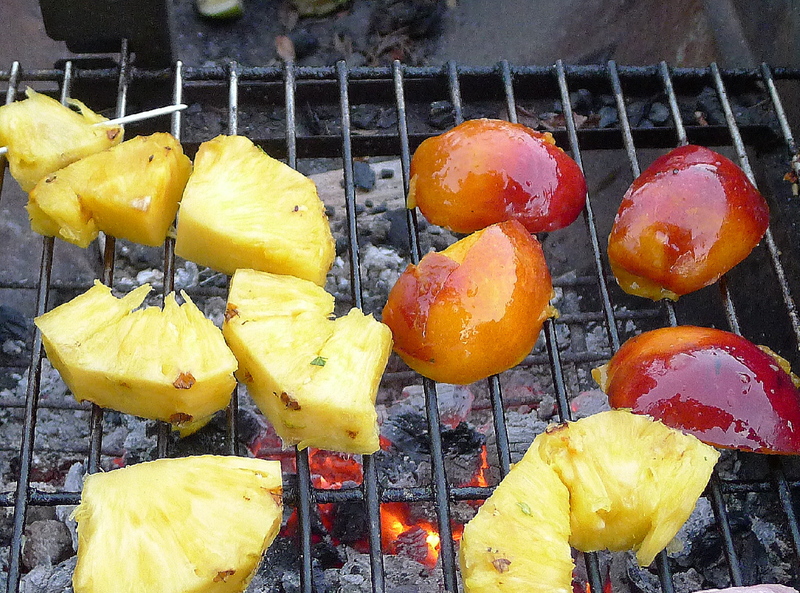 He’s expert in knowing just how hot the coals should be, the placement of the racks, the time before flipping foods. Experience is what it’s all about. One trick I learned from Ben—don´t oil the grill. Just wipe it with a cut lemon. Get the grill good and hot before placing food on it. Food never seems to stick. Cut vegetables in chunks for the kebabs. 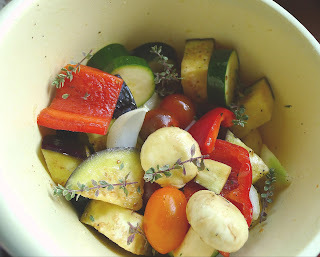 Add olive oil, lemon juice, salt, pepper and sprigs of herbs. I'm using lemon thyme and fresh oregano. 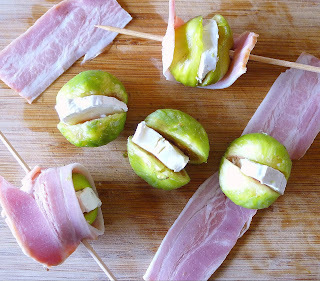 Those figs--slit them open, insert a slice of goat cheese, wrap in bacon and skewer. Too good--sweet figs, crisp bacon, creamy cheese. 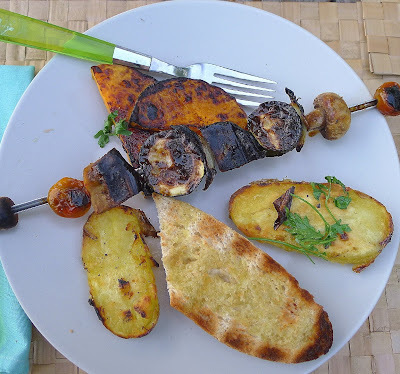 Grill slices of baguette brushed with oil and heap the grilled vegetables on top. Give fish some space too! I´ve got some fresh trout. I picked some grape leaves from the arbor and used them to wrap the fish. 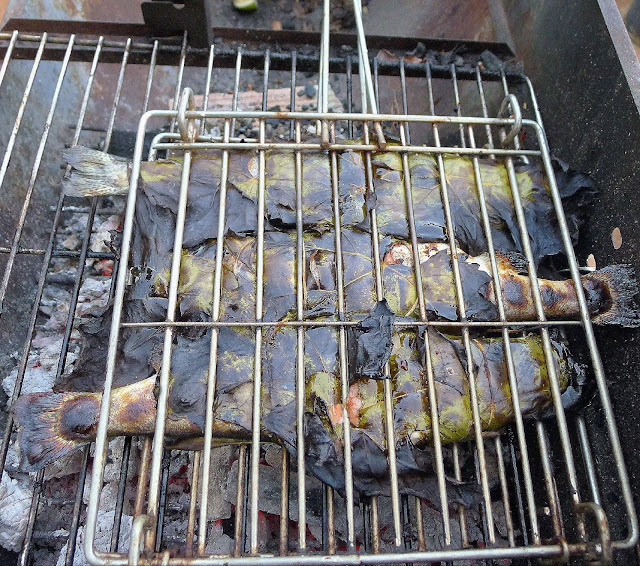 The leaves add a lemony flavor and keep the trout from sticking to the grill rack. The trout are wrapped in bacon first. 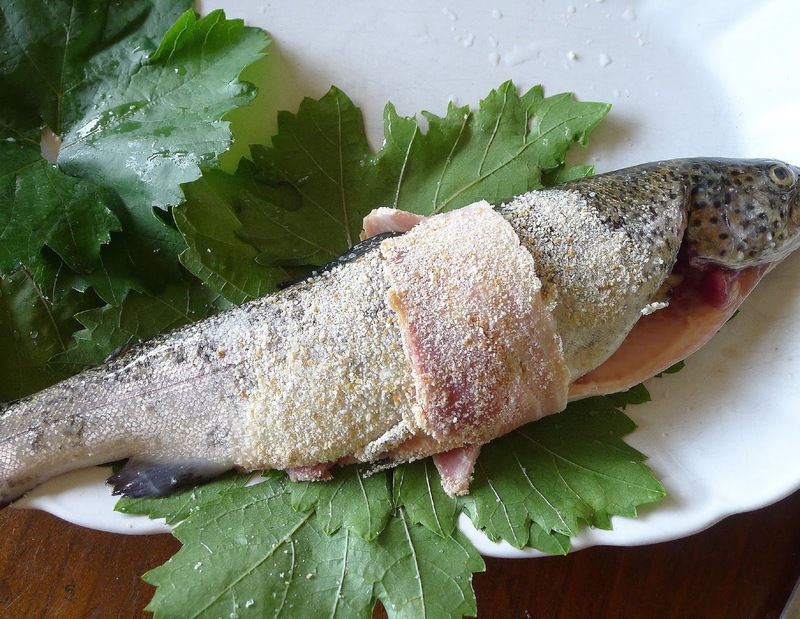 A dusting of fine bread crumbs makes the slippery trout easier to handle. 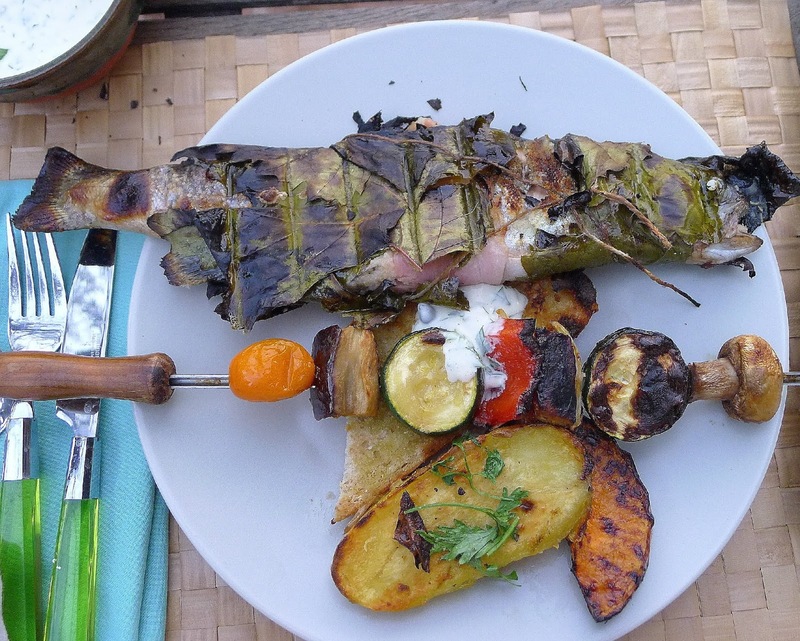 Grilled trout stay moist in a grape-leaf wrap. The hinged grill makes flipping fish easy. Fish and vegetables get equal space on the plate. 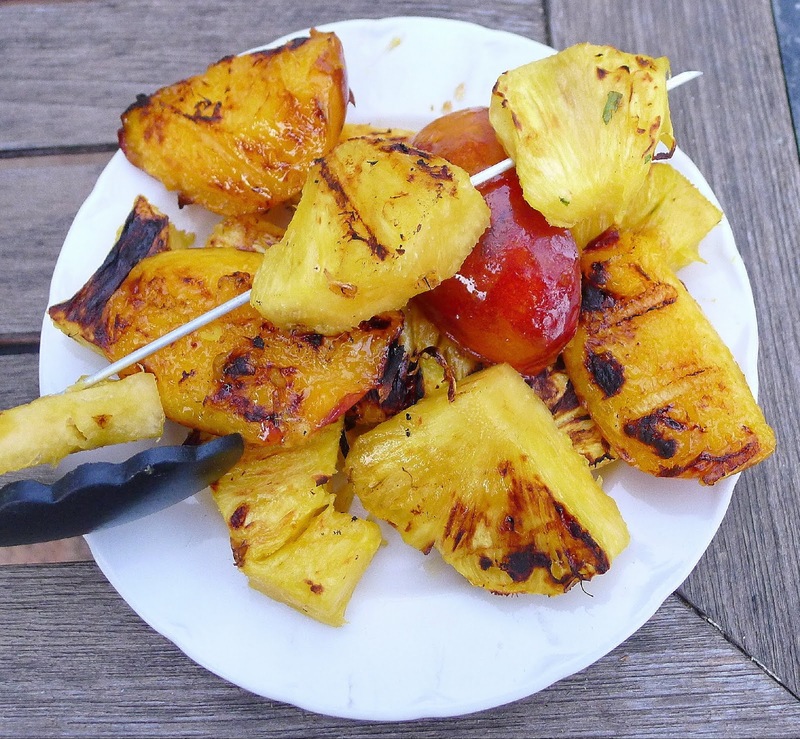 While we're eating the meal, chunks of pineapple and nectarines grill on the remaining coals. We ate the grilled fruit straight off the fire. But they would also be delicious served with slices of sponge cake and vanilla ice cream. 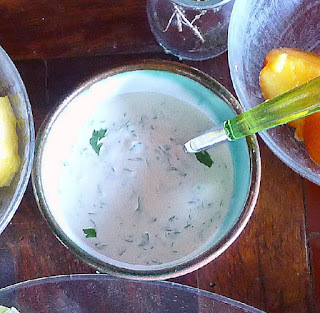 Mayonnaise-yogurt sauce goes with the vegetables and the fish. Beat the mayonnaise until smooth. Beat the yogurt until smooth. Combine them in a small bowl. 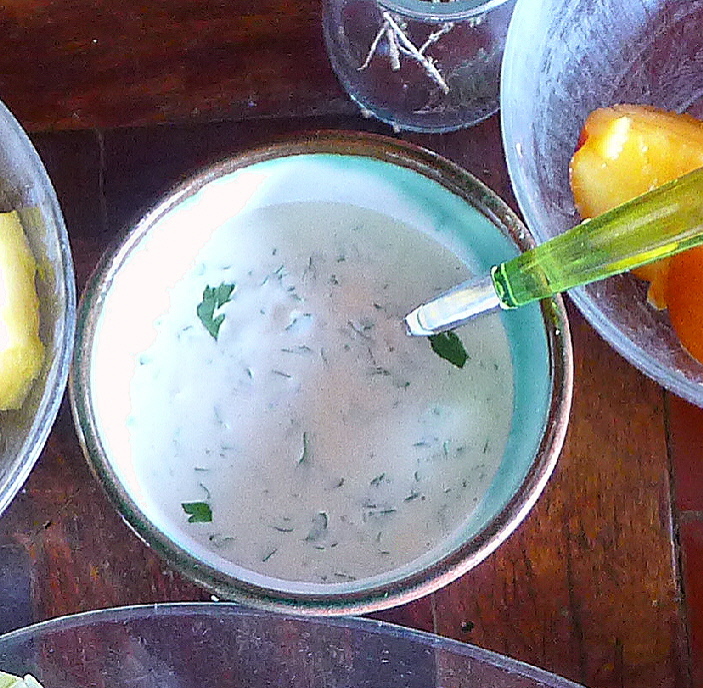 Beat in the oil, vinegar and mustard. Stir in the capers, onion and parsley. Add salt to taste. Grilled Eggplant and Peppers (Escalivada). Lamb Stew with Grilled Peppers. Quail Grilled in Grape Leaves.